Fortishealthworld.com is the ecommerce portal of RWL Healthworld Ltd. (formerly known as Religare Wellness Ltd) one of India’s leading healthcare retailers which operates a chain of over 100 retail stores across Delhi NCR, Pune and Bangalore. The eCommerce store was launched with a vision of extending discerning store services and an exciting assortment of wellbeing products, to its customers, at the click of a button. The main challenge for Fortis Healthworld was reducing the PPC spends-to-sales ratio to make the eCommerce operations profitable. It had to compete against established, eCommerce giants such as Amazon and Flipkart in many product categories. And these giants had deep pockets that allowed them to keep funding discounts and lure customers to their sites. Under the circumstances, this was a tough ask. With more than 4500+ products on offer, the challenge extended to understanding seasonality and demand of the products on offer. devised seasonal campaigns to leverage seasonal demand for specific health products. For example, anti-pollution masks and air purifiers saw massive surge in demand in the few day immediately after Diwali 2016. Hard work always pays, and in this case also, the continuous, comprehensive and controlled efforts taken by our team paid rich dividends. In the last one year, goals of our campaigns exceeded the expectations of the client as overall spends-to-sale dropped drastically while maintaining our sales targets. The overall spends-to-sales ratio decreased significantly by 72% in February 2017 from March 2016. Maintaining a sale volume above the client’s expectations while constantly reducing the cost per sale, gave a big boost to our confidence. As the below chart shows, we were able to bring a sharp decline in ratio in the first month itself, which we were able to maintain over the next six months. 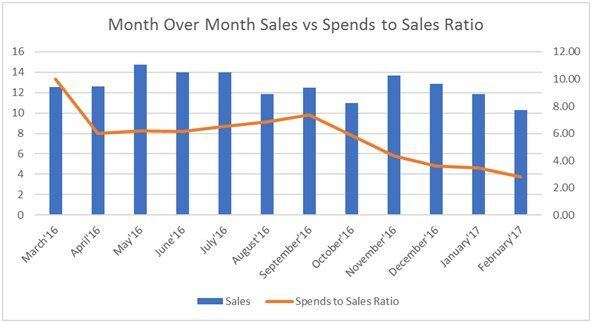 And after September 2016, our planned campaigns have witnessed a steady decline in spend-to-sales ratio month-over-month. NOTE: The absolute numbers have been indexed, with Mar. ‘16 set equal to 10, in order to facilitate the comparison of growth over the next 12 months. 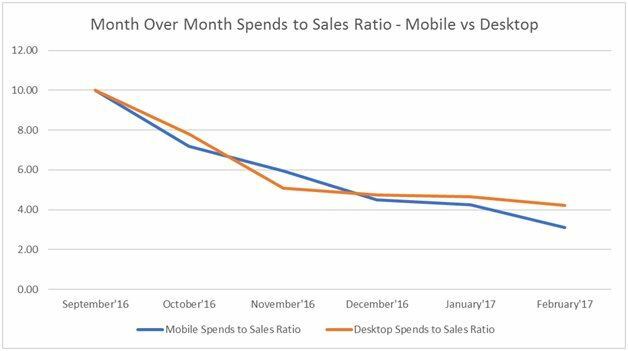 We witnessed a considerable decrease in spends-to-sales ratio on both mobile and desktop - on mobile devices an impressive decrease of 69 percent was witnessed while on the desktop the decrease was slightly less, but still impressive at 58 percent. NOTE: The absolute numbers have been indexed, with Sept. ‘16 set equal to 10, in order to facilitate the comparison of growth over the next 6 months. As we met the objective of optimizing the PPC campaign to make the eCommerce operation profitable, we once again substantiated that research backed by science and dedication is the way to achieve success. A significant decrease in spends while maintaining the topline helped our client to establish an authoritative digital presence. We helped them build an identity as a trusted online retailer and our targeted strategy continues to drive growth.